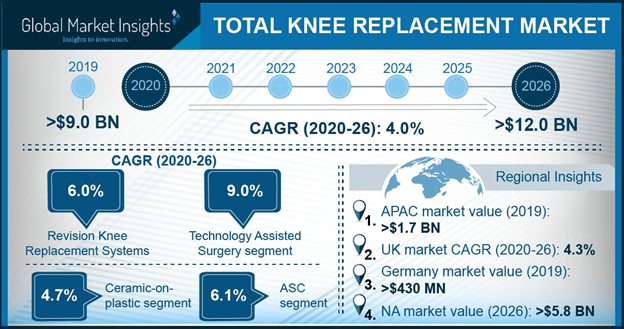 Total knee replacement market size was valued over USD 8.0 billion in 2017 and is expected to witness growth of around 3.7% CAGR from 2018 to 2024. Globally, increasing prevalence of chronic bone disorders such as osteoporosis and rheumatoid arthritis in the growing geriatric population will drive the industry growth during the forecast timeframe. For example: The U.S geriatric population is around 46 million and most of the old people suffer from chronic arthritis influencing the business growth across the nation. Moreover, medical insurance provider companies are developing policies that prove beneficial for the elderly population that have high preference for knee replacement procedures. For instance, in U.S., medical insurance providers such as Medicaid and Medicare have created favourable reimbursement scenario resolving the affordability issues of the geriatric population with relatively lower income levels; thereby stimulating the industry growth by increasing the demand for cost-effective knee replacement procedures. Technological advancements in implant materials used for knee replacement surgery will result in increasing demand for the same. Companies such as ConforMIS provides customized 3D printed implants to exactly match the patient’s anatomy. Materials such as kneecap, inserts and jigs are also customized to lessen surgery time and deliver better outcomes. Technological shift from traditional invasive surgery towards minimal invasive surgeries will favour market growth over the projection years. Primary knee replacement market is anticipated to be the fastest growing segment with a CAGR of 4.3% by 2024, owing to its long-lasting results, availability of advanced technologies and complete relieve from arthritic pain. A majority of primary knee replacement surgeries is performed on women due to high prevalence of diseases such as osteoarthritis and obesity. With objective to address the need, companies are designing products to particularly meet needs of female stratum. Partial knee replacement market size was valued around USD 3.9 billion grabbing around 49% market share in 2017 due to ability of customize the products to replace only the damaged part of the knee affected by degenerative diseases and restoration of healthy tissues and bones. Advanced technology such as robotic arm assisted partial knee replacement offered by Stryker will stimulate market growth. Femoral knee replacement market size was USD 3.8 billion in 2017 accounting for maximum market share. Advantage offered by femoral knee replacement that assists in knee cap movement providing maximum stability with reduction of flexion gap caused by abscission of knee component to restore normal functioning of knee will augment demand for total knee replacement surgical procedures. Tibial knee replacement component market is expected to witness significant growth rate of 4.0% during the forecast period; mainly due to its efficacy in patient’s knee protection by providing resistance to shear, reduction in micromotion to increase stability and averting risks of tibial lift off. Advantages and additional benefits provided by tibial component increases its adoption rate amongst the surgeons, thus boost demand. Hospital market segment dominated market with revenue of around USD 6.8 billion in 2017, since majority of knee replacement surgeries are conducted in hospitals due to availability of advanced technologies and trained professionals in these healthcare settings. Additional provision and intensive care provided post the surgical procedures in hospital will fuel business growth. Ambulatory surgical centre market segment is forecast to grow with highest CAGR of 5.4% over the forecast year largely due to availability of surgical procedures at lower cost and less probability of numerous infections. US healthcare costs reduces by USD 38 billion every year due to the presence of outpatient surgery facilities as indicated by study of commercial medical claims influencing the demand for ambulatory surgical centres. U.S. total Knee Replacement market size was around USD 3.2 billion in 2017 and is expected to increase beyond USD 4 billion by 2024. The presence of major market players and increasing prevalence of people suffering from degenerative diseases will fuel market growth. In 2015, around 55 million adults in U.S. suffered from Arthritis as per the center for disease control and prevention data. In addition to this, favourable government initiatives making the surgeries cost-effective will foster market growth over the forecast period. Germany total knee replacement market will witness vigorous growth around 4% from 2016 to 2024. The growing geriatric base coupled with rising prevalence of diseases such as osteoporosis will fuel the market growth. Eurostat stated, around 21% of total population of Germany had population in the age group of 65 years and above during 2015 and prevalence of chronic bone disorders is high amongst geriatric population proving beneficial for the industry growth. Presence of organizations such as the European Society for Clinical and Economic Aspects of Osteoporosis, Osteoarthritis and Musculoskeletal have undertaken certain initiatives to lower the surgical costs enhancing the industry growth. Some of the prominent industry players operating in total knee Replacement market include Stryker, Smith & Nephew, Medacta, MicroPort Scientific, B. Barun, ConforMIS, DePuy Synthes, Corin, DJO Global and Zimmer Biomet. Development of advanced products for better outcomes and rigorous marketing are competitive strategies adopted by market players. In April 2014, Zimmer Holdings merged with Biomet to lead musculoskeletal industry and sustain its leading position in the market. 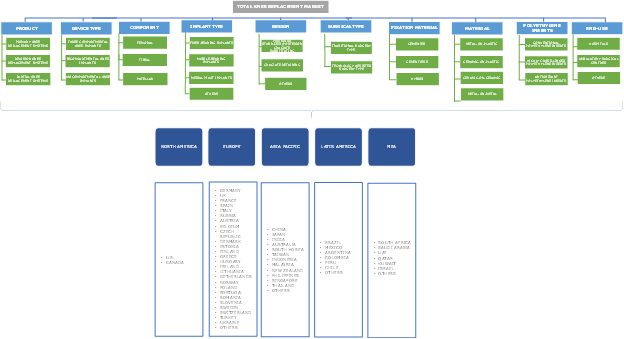 New product launches, advertisement of products to surgeons as well as patients, merger and acquisition are strategies used by industry players. Presently, FDA approved patient specific guides are designed by manufacturers to assist surgeon in total knee replacement to increase use of patient specific implants in total knee replacement surgery and match maximally to patient’s knee delivering better results fuelling the market growth. Total knee replacement market is experiencing an exponential growth. Owing to growing global population suffering from degenerative diseases. Knee replacement is widely preferred solution towards severe pain caused by degenerative diseases such as Osteoporosis. The damaged joint of the knee is replaced with artificial implant restoring normal functioning of knee. Introduced in 1968, the industry has witnessed continuous upgradation in technology. Presently, customized knee implants are developed to exactly suit patient’s anatomy to ensure better outcomes. Also, development of reimbursement scenario has resolved the affordability issues of the geriatric population increasing the preference towards knee replacement surgeries and augmenting industry growth.